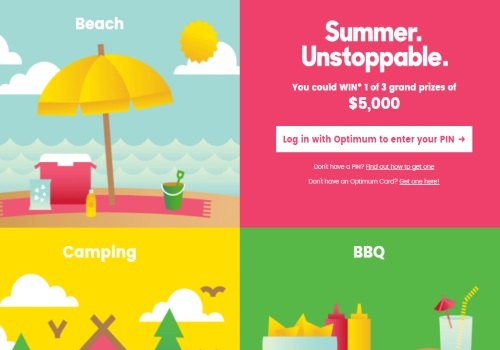 Shoppers Drug Mart has a new summer contest! There are 5000 reasons to love summer with this new contest! Enter to win 1 of 3 $5000 grand prizes! There are 3 grand prizes of $5000 and 200 online instant win prizes of Shoppers Drug Mart gift cards, ranging from $25-$50 available to be won. Log in with your Optimum card at the link below to enter your PIN to win. To receive a contest card you must make a purchase of $10 or more of eligible products after discounts and redemptions at participating stores. You can also win instantly by exploring products at the link below, just click on the products, if you wi you will see a popup message. Contest closes June 19, 2016.
no you still need a pin code that's what the pop up message says!!! !